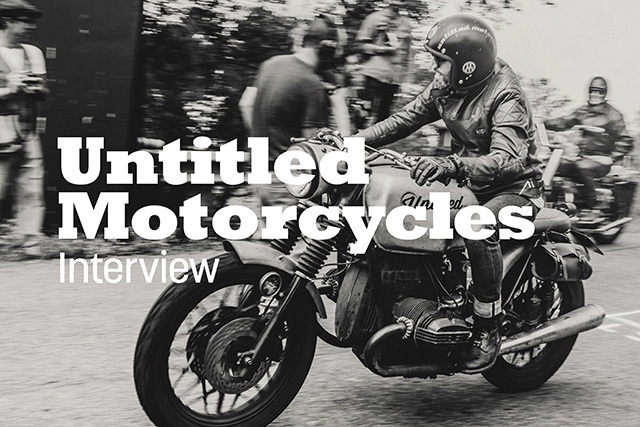 We were lucky enough to interview the talented guys from Untitled Motorcycles recently. 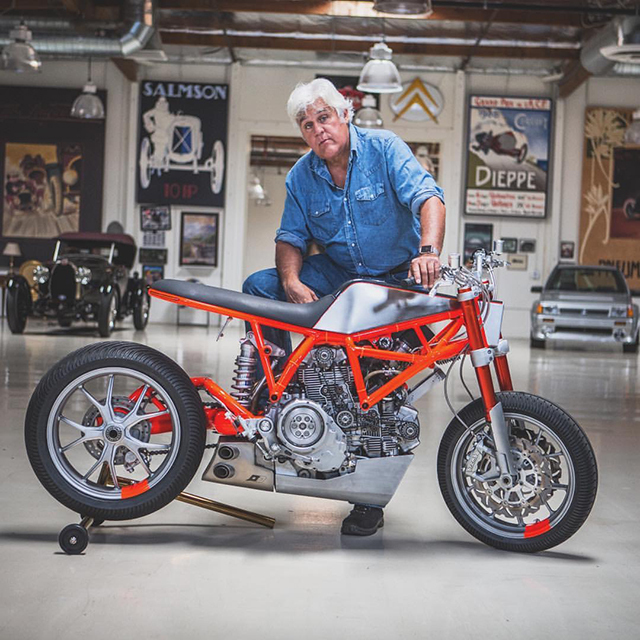 They have been busy building bikes, hanging with Jay Leno and doing a small production run of their HyperScrambler. Adam Kay runs the UMC London workshop while across the Atlantic, Hugo Eccles runs the UMC San Francisco workshop. Can you introduce yourself to our readers? What’s your background? Adam Kay UMC-LON: I come from a fashion and art background. I worked in the design and production departments of a few high street stores helping to make sure that the original design intent was carried through to production. I left that world to study sculpture at the Royal College of Art- even exhibiting some of my work in a few galleries – before building motorcycles. Hugo Eccles UMC-SF: I’m a career industrial designer of twenty years- almost as long as I’ve been riding bikes. I originally trained at the Royal College of Art and then spend the next decades working for the likes of IDEO, Fitch and Sir Terence Conran. A few years ago I moved to San Francisco and decided to combine my two passions- design and motorcycles- and build custom motorcycles full time. 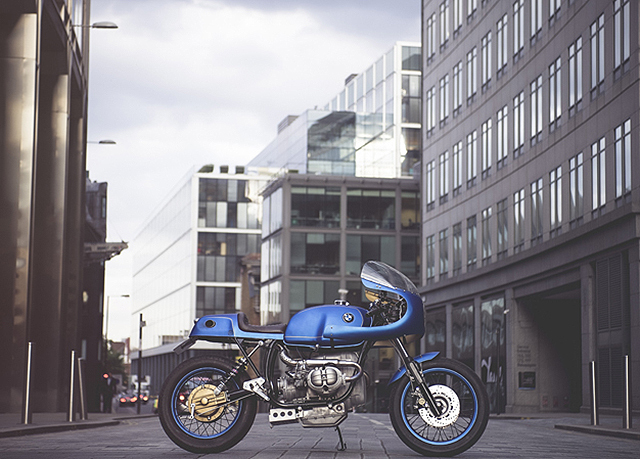 Untitled Motorcycles (UMC) is located in both London and San Francisco? Do you and Hugo collaborate or are they run as separate businesses? AK: They’re separate but also the same. We often share same challenges and we talk once a week to go over issues that each of us face: two heads are better than one, as they say. We both bring different ideas and processes to the business and that keeps things fresh. Hugo and I originally worked together on the UMC-021 Raw and he brought new ideas for the build that I hadn’t done before. It’d be great to visit San Francisco more often but, unfortunately, I’ve too many builds at the moment. Along with a young family it makes it really hard to get away. HE: We have both a UK and a USA workshop which is really useful for sourcing difficult-to-find parts. Often there’s stuff Adam can’t find in Europe or vice versa. 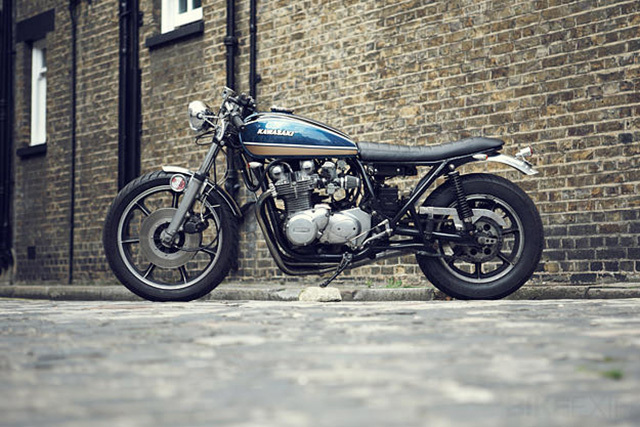 London’s been running since 2009 and was one of the earliest proponents of the cafe racer scene, featured in The Ride, and was for a long while the only custom motorcycle workshop in central London. Adam and I worked together in London for a while before I set up the San Francisco workshop when I moved here two years ago. We have our own clients but talk at least once a week to discuss business, collaborate on ideas, and share war stories. How often do you cross the Atlantic? HE: Not as often as I’d like. I’m originally from Oxford and still have family in the UK but flying from the West Coast is expensive. I also have a long waiting list of builds here in SF so finding time to get back home is sometimes tricky. I’m trying to get back in September to catch up with friends and family and go to the Goodwood Revival (of course!). 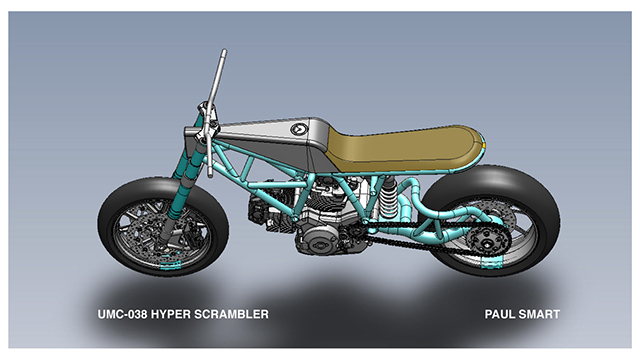 The UMC HyperScrambler got a lot of worldwide exposure. Are you doing a production run of them? HE: Yes, there’s going to be a limited edition production run of the HyperScrambler in various Ducati-inspired colours. 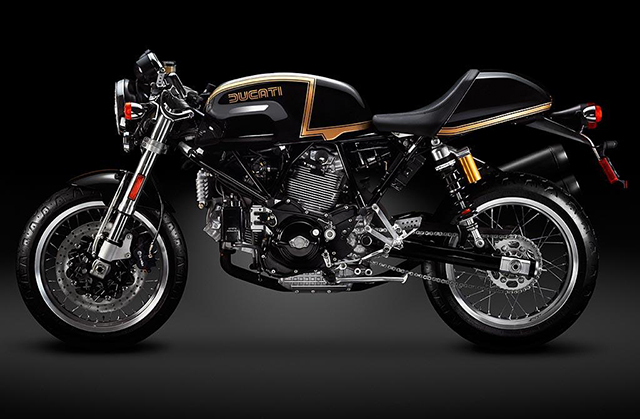 Ducati has such a rich history of fantastic colours from the black & gold Pantahs, to the Paul Smart sea green, to the neon orange Superleggera. Buyers can choose from a selection of those colours and specify various components and finishes. AK: I got my first motorbike at a relatively old age of 24. I’d always wanted one but my family was really against it. I eventually got one after I broke up with a girl. As soon as I got my bike license I went straight to a dealer and put my money down on a 600cc Ducati Monster. I was so desperate for it I bought a yellow one although I really wanted the classic red. I loved that bike and rode it everywhere, even during the UK winter: I remember the carbs freezing on the M25 and having to stop to let them thaw out. When I got off the bike I couldn’t move my hands for about an hour. 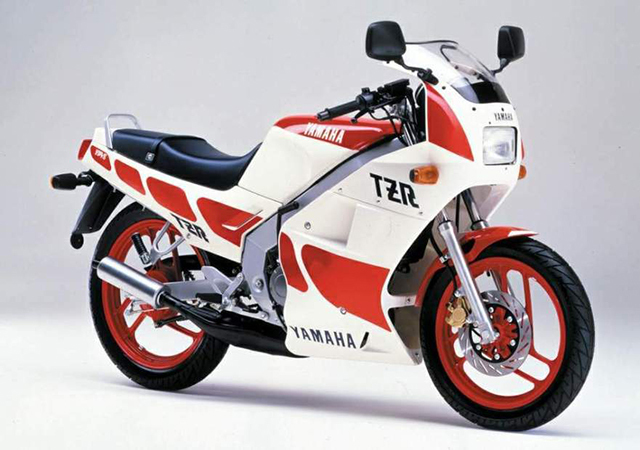 HE: Yamaha TZR125. I rode that bike everywhere, crashed and repaired it numerous times. I eventually got my full license and switched to a ZXR400 which was brilliant fun, after which I owned a Ducati Supersport 400, then a Ducati 748 which I put 47,000 miles on by commuting across London and travelling throughout Europe. What’s the best ride you’ve been on? AK: So many but my recent ride in Europe was amazing. I went with two guys, Gav and Chris, who’ve both bought bikes from UMC and are now good friends. Riding along fantastic mountain roads on machines that I’d designed and built felt extra special. 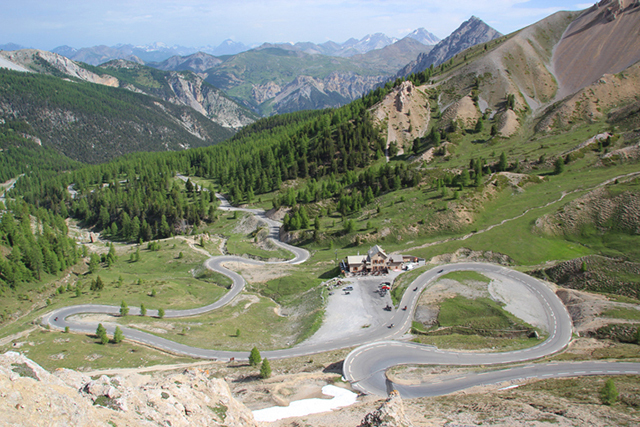 The one road that really stood out was The Route Napoleon in the Cote d’Azure: sixty miles of uninterrupted winding black top with views to die for. We couldn’t decide between either nailing it or staring at the scenery so we rode it three times! HE: That’s a difficult one. There are amazing roads and rides here in Northern California, and the weather allows year-round riding, so I’m really spoilt for choice. I often ride over Mount Tamalpais and along Mines Road in Livermore. My favourite European trips are probably a ride back in 2003 with my mate Russell across France and Italy up though Austria and into Germany, and a 2008 trip across France with Ducati 916s and an Aston Martin DB4 for the Le Mans Classic. What’s the favourite bike you’ve built? AK: My favourite bike is always the last one. I just love seeing something that I’ve put so much time into ride off with a happy owner smiling from ear to ear. I also get to test ride them beforehand and that’s a great thrill. 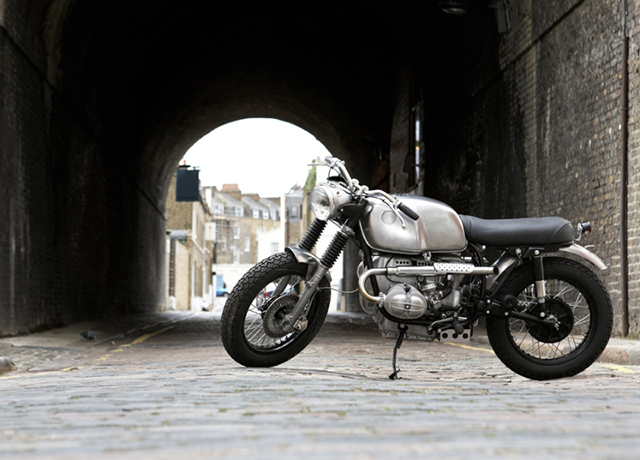 A constant favourite is the second bike I ever built: UMC-002 Scrambler. I get to see it maybe once a week because the owner- photographer Ludovic Robert- is now a friend and he often comes by the ‘shop to hang out. Ludo also takes all our photographs for us here in the UK. HE: I’d have to steal a quote from Carroll Shelby and say “the next one”. I have a 1975 Moto Guzzi 850T in the pipeline that I’ve designed a completely custom alloy tank as an homage to the LeMans. It has modern USD forks, is significantly lighter, and more responsive thanks to a lightened flywheel and larger carbs. I’ve got a real soft spot for these Tonti-framed Moto Guzzis- they’re really the epitome of the cafe racer- so this project is pretty close to what I’d build for myself. Looks like you’ve been busy this year. Can you tell us about your latest builds? AK: I have a Triumph Newchurch (a Bonneville with cast wheels) that’s going to be rebuilt as an urban scrambler with a Thruxton front end, spoked wheels, shortened subframe, and integrated headlight-speedo unit. Another build that’s going to be a real looker and ride very well is a Guzzi 850 T3 cafe racer with seat hump, rear sets, hard thin seat- a bit of a brutal machine named it ‘Vivo’ which translates as ‘intense’ in Italian, and it really will be. 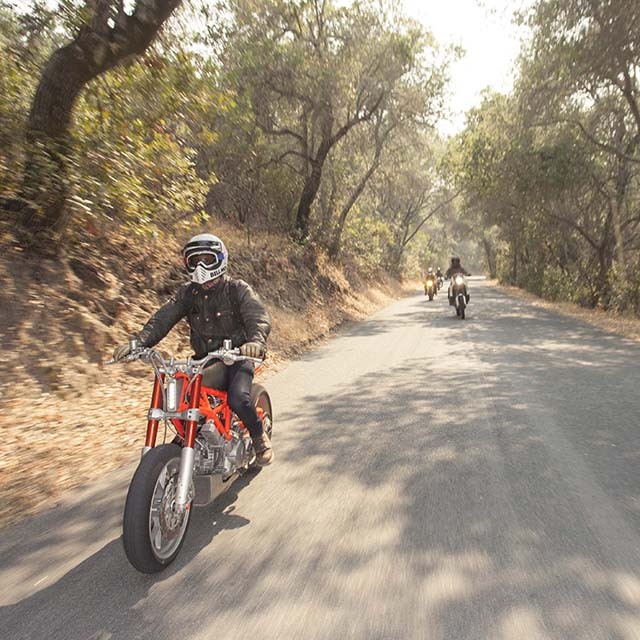 What’s your fondest memory on a motorcycle? AK: I’ve always loved motorcycles. I don’t know why as my family has no interest in them to the point that they really don’t like them. I just remember watching the first Mad Max film and wanting to ride all the bikes. I’ve seen the film recently and boy is it slow. Nothing really happens until right at the end however the bikes are still great. 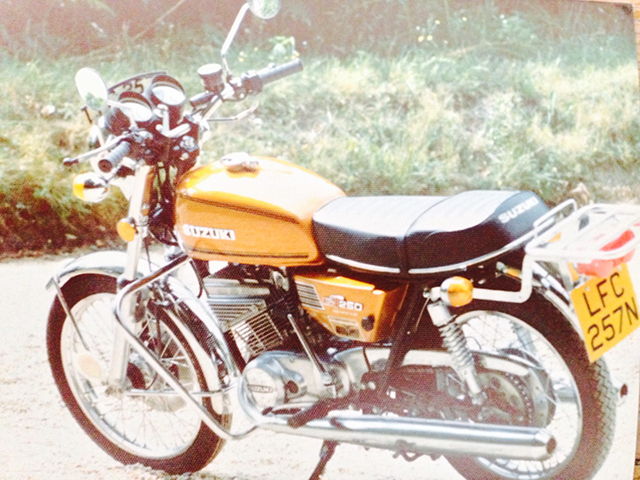 HE: My fondest memory is probably my earliest: my Dad had a 1975 Suzuki GT250 when I was a kid and I think that’s what really sparked my interest in bikes. He used to commute from the countryside to London in his suit and tie under a one-piece waterproof: quintessentially James Bond to my young mind. AK: I have a motorbike leather jacket that my dad made for me when I was 17. It took about 5 years to wear in as the hide was so thick I could barely bend my arms. I now wear a Knox jacket with the layer system that works in the summer and winter. I wear APC jeans to ride to work I have 4 pairs of them in different states of disrepair. I know they have no protection but they feel comfortable and that makes me feel good on a bike and for me that’s most important. I also have a pair of Red Wing boots which I resisted getting for ages since so many riders have them but I’ve worn them every day for over a year. They so comfortable even on the hottest of days. I had to get them re-soled recently as I have a habit of scraping the bottoms along the ground whilst riding to cleaning off the oil and grease from the workshop. My favourite piece of gear is my Davida helmet. It fits so well, has great peripheral vision, and is covered in hundreds of UMC stickers: people definitely know I’m around when they see my lid on the helmet rack at The Bike Shed. HE: I’m a creature of habit and just basically wear the same stuff all the time. I’m a fan of Thorogood boots and I’ve paired mine with the ‘Shifty’ boot protector by Acme Studios. For the past decade I’ve worn a Belstaff Mojave jacket and either wear regular jeans or Dainese’s Kevlar-reinforced Wayne trousers. Helmet-wise I have an open-face Fulmer- they made the original Easy Rider helmet- and a full-face Bell Bullitt. I wear either insulated Barbour gloves or the Harold’s Gripping Gloves depending on the weather. I have a Bell & Ross watch that, despite my best efforts, keeps on faithfully ticking away. You ever had a bad crash? AK: Never a had a bad crash and just writing this makes me feel a bit nervy now. I’ve come off a few times, mainly slow spills on grease roads. I ride in London every day and see some diabolical driving so I know it’s a real possibility that someone could knock me off so I ride aware. People driving while using their mobile phones is on the rise and that’s really worrying: I once saw a cabbie driving and playing a video game on his tablet. HE: Ha, yeah, a few. I had a 60mph tank slapper crash outside of New York a few years ago but, luckily, both me and my bike came away unscathed. I rode in London on a daily basis for years so had numerous scrapes, slides and crashes (I think about nine?). My ankles and knees aren’t quite as good as they once were. I used to carry handfuls of snap-off bolts for my Ducati 748 mirrors because they’d get knocked off so often filtering through the London traffic. What’s your favourite modern bike? AK: Moto Guzzi MGS-01 not ‘modern’ by any stretch of the imagination but I love that bike. 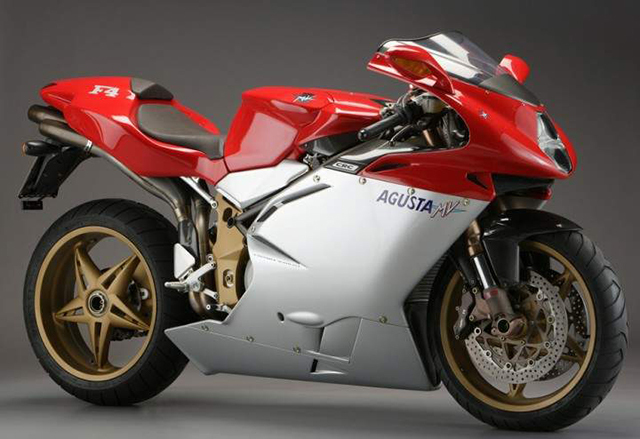 HE: I love the work of Massimo Tamburini so one of my favourites is the MV Agusta F4 Oro with carbon bodywork and magnesium cases. His Ducati 916 is a classic but that was created 22 years ago so I’m not sure if that counts as ‘modern’. To be honest, most modern bikes leave me a bit indifferent. If pressed, I’d choose either a Ducati Panigale or a Husqvarna 701 Supermoto. There are some great modern concept bikes I’d buy if they made them. 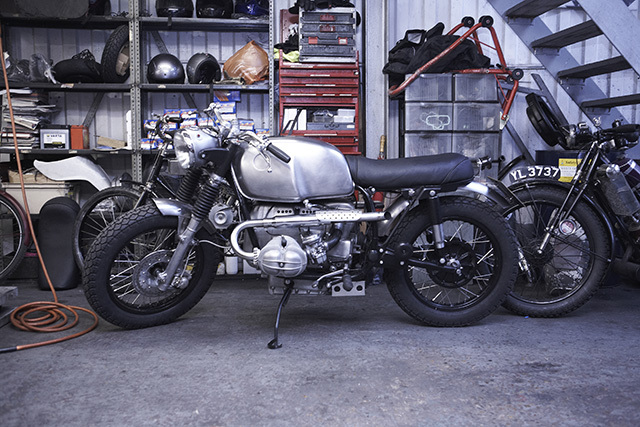 AK: My usual daily ride is UMC-001, the first custom build: a 1979 BMW R80/7 which has evolved over the years. It’s a bit rough-and-ready as I use it as a test bike for bolt-on parts we’re developing to sell. However at this moment I’m actually riding two bikes: the UMC-028 Bol d’Or and UMC-036 Raw II. Both bikes are about to feature in a film about the custom bike scene. HE: My daily ride is a 2006 Ducati Sport 1000 Mono that I bought new from a dealer in Dallas and rode 2,000 odd miles back to New York City along back roads and the Blue Ridge Highway. Unbelievably, at the time no one wanted them and they were cheap to buy. The bike has relocated with me twice from New York to London and from London to San Francisco. I also ride the HyperScrambler prototype on a regular basis as that’s my test mule for the limited edition production version. Dream bike if money was no option? AK: I’d start by building a very large garage attached to my house and fill it with all sorts of bikes: Moto Guzzis that I could customise plus Ducatis, BMWs, Triumphs, Harley’s – anything that’s a twin I like. HE: Well, I think it’d have to be something that I designed or at least modified. I can’t really leave anything well enough alone. It really depends on what I was doing. I’d need a proper sled for the desert, a track bike for Laguna Seca, an urban supermoto, and then just some stuff for shits and giggles. There’d probably have to be an electric bike in there too, maybe the Mission R or the Alta flattracker. It’s good that money isn’t ‘no option’ or I’d have about twenty bikes. The one bike you wish you never sold? AK: Nope nothing yet. Bikes that I wish I didn’t have to give to a customer, yes, but that’s a different story! HE: I’d happily keep most bikes I’ve owned. 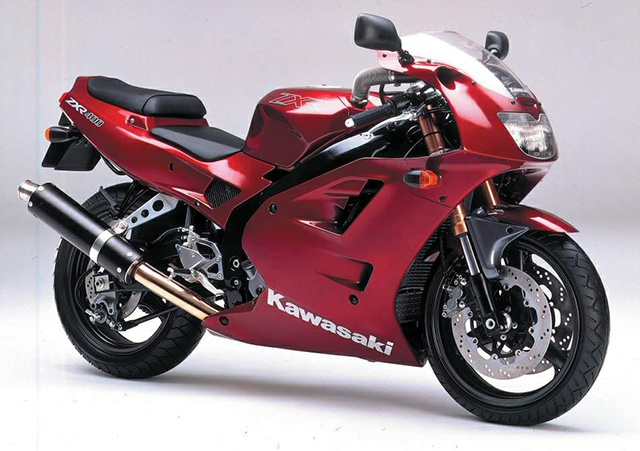 Early on I had a limited edition Kawasaki ZXR-400, plain metallic red with black frame, which was a great bike. Unfortunately I didn’t get a chance to sell it because some toerag stole it. 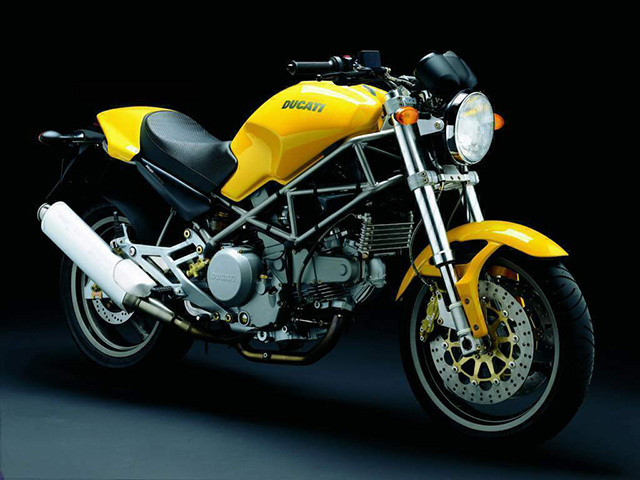 My Ducati Supersport was a favourite as I’m a fan of that snub-nosed form evident in the 851 and 888 too. In 2007 I had the option to buy a black and gold Limited Edition version of the SportClassic (No. 69 of 100 I remember) which, to this day, I regret not doing. What’s up next for Untitled Motorcycles? AK: Getting into bigger builds with major motorcycle brands.